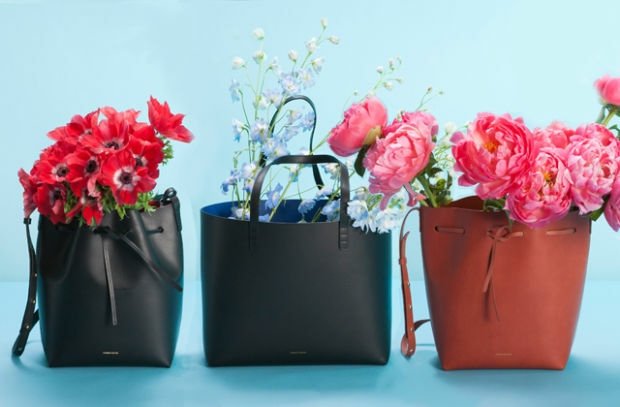 not going to lie, i've experienced my fair share of admiration from afar for the much-lauded, ever-elusive Mansur Gavriel bags over the past few seasons. a few months ago, i finally got to see the bucket version in person at a store, and i quite liked the feel and thickness of the leather. the leather looks very 'hard' and stiff in photos, but in person, it seemed to have some more pliability and had a nicely soft/matte texture. however, the large bucket that i tried on seemed huge on my frame, and everything else was sold out or pre-order only, so i left empty-handed. after seeing a few friends and readers with their rather handsome MGs, i'm now freshly contemplating adding one to the collection. if i get one, i will definitely do a detailed review here, so stay tuned. in the meantime – dear readers, please chime in: if you have a MG, how do you like it? how has the leather worn in? update 8/5/2015: i ended up getting the tote, detailed review here. Those bags seriously look good. If you are contemplating getting one, do check out purse forum. There are a lot of mixed reviews on the wear of the bag. thanks for reminding me - some useful discussions indeed on tpf! I'm desperate for a bucket bag (and I know the style works well for me since I've been using a cheap pleather MG dupe from H&M for the last few months). Looking at the MG ones online I was slightly concerned about the hard, smooth look to the leather - I tend to sway towards leather with more of a grain because it hides scratches/wear and tear better. I'd really like to inspect one in person and feel the material. the large bucket bag is quite large and doesnt look right on a petite framed woman. so i opted for the mini version, which is perfect size and actually holds quite a bit of stuff. i just wished it came with a pouch like the larger version. i was skeptical about buying the mini bucket because it doesnt have a zip top closure for security reason. plus i thought it would be cumbersome to tie and untie the strings whenever i open and close the bag. luckily, if you leave the bag untied and wear it crossbody, the top part pinch close together as if you zipped it closed! the black leather is super light and softens with continued use. it does show signs of wear and scratches. the leather does have some slight texture feeling after using it for some time now. you can feel it if you run your hand against the grain. However, all that doesnt bother me at all and is quite beautiful and adds personality :) one word of caution, the dark leather does color transfer to light color clothing light white demin. i learned that the hard way, but was able to remove the stain off the jeans. i would totally recommend getting this bag. it's so simple but chic. hope this was informative. good luck! Sandy - this is so helpful. thank you! :) in the mood for a great patina bag these days. If I didn't already have 7464873738 black bags, I would sorta be tempted, but then I couldnt decide if I wanted the tote with the red or blue inside. But also I'm skeptical of big bags with skinny straps. P - haha! i am on the No More Black Bags train...actually really leaning toward the camello /natural patina leather MGs. I don't have one, but MAN, do I want one!!! On a side note, I walked in to my local Steven Alan store and they had the BEST new MG small cross-body bag styles. TO.DIE.FOR. I don't think they're on the website, tho. i hate to be the debbie downer here, and i hope you get a MG bag if that's what you desire. but, i just don't think they are made that well. i checked them out at steven alan and was not a fan of the slick feeling the leather. it just felt plastic-y and fake to me. i admire leather that has a nice heft and weight to it, and i find the MG bags to be kind of flimsy for the money. just my take on it, though. they do look lovely and i am a fan of the color combos. i hear you on the leather texture preferences! a lot of people seem to really like how the leather wears in and how light it is, so if i get one will definitely update here with a detailed review! I've been wearing my saffiano (barney's exclusive) mini bucket for about a year or so now. It's doing well. the bag is softer but still structured. the corners have worn a bit, which i do not like. but for the amount of wear and tear and rain i've put it through, I think it's been a nice journey so far. I saw a large brown MG bucket on a girl at an event and it was so worn in - soft looking leather, patina, scratches and all and it just looked sooo good. So something to consider! I personally like the larger bucket for fall/winter when wearing over coats!